Hawaiian Kona coffee, America's world renowned coffee, is grown in the Kona district of the big island - Hawaii. 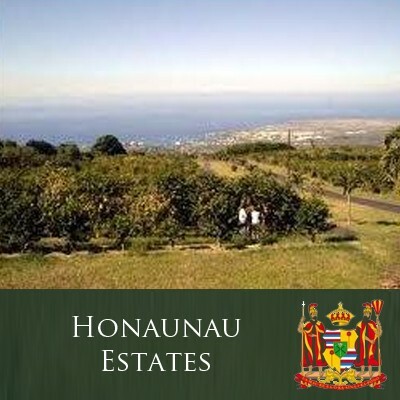 Our estate Kona coffee is grown on an ahupua’a (land division) named Honaunau. Here, a group of dedicated small farmers grow Kona coffee on the big island at elevations ranging from fourteen hundred to two thousand feet. Pockets of rich volcanic soil nurture the coffee trees that produce the delightful Hawaiian Kona coffee. This is a complex, well balanced coffee - one to be savoured. We take pride in offering only the best Kona coffee. When you purchase Kona coffee from J. Martinez & Company, you will always receive pure Kona coffee from Hawaii, not a Kona coffee blend, which may contain as little as ten percent actual Kona beans. Kona coffee is one of the finest coffees in the world. It is also, of course, an American coffee; at least, it has been since 1898 when Hawaii became a U.S. territory. Coffee was introduced to Hawaii in 1828 using Brazilian cuttings. Kona quickly became the premier coffee district of the islands. The western slopes of the Mauna Loa Volcano form a very special microclimate for growing Kona coffee in Hawaii. Kona is well suited to coffee growing. Unlike the rest of Hawaii, Kona receives its rainfall in the summer, similar to other coffee-growing regions of the world. In addition, the high mountains shelter Kona from the persistent tradewinds that blow across the islands. 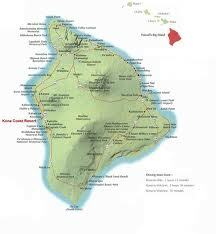 In fact, the leeward sides of all the major islands in Hawaii were called "Kona" in ancient Hawaiian. In most areas, the coffee trees appear to be growing directly on the lava beds which underlie the entire district. On only one area is there much soil - Holualoa, where the ice age flows have left time for soil to form. The actual area within the Kona district suitable for growing coffee is quite limited due to several factors. The steepness of the volcanoes and a narrow altitude band restrict the planting area. Below 800 feet it is too dry and hot to grow coffee; above 2,500 feet there is a natural rain forest which causes the coffee to flower year-round, rendering it impracticable to cultivate. Higher elevations are too cool; killer frosts sometimes occur as low as 4,000 feet. Mark Twain mentions the Kona coffee trees in Hawaii in his book, Roughing It, about his adventures as a young man in the West between 1861 and 1867. He makes a trip to "The Sandwich Islands", as Hawaii was then known, and has some interesting descriptions of the islands and its natives, laced with his humor and tall tales. Most of the coffee farms in Hawaii are small holdings, with many still farmed by the descendants of the many Japanese immigrants who initially farmed the coffee. Due to the steep rocky terrain, capital intensive farming is limited. It is an expensive coffee to produce, due to the terrain and higher cost of labor (farms are subject to U.S. labor laws) and inputs, but due to its exceptional quality, it is a profitable product for the growers. Our Kona Hawaiian coffee from Honaunau Estates is an excellent example of what Kona can produce. This Kona estate coffee has a complex aroma, is well balanced, and has a lush and lingering finish.